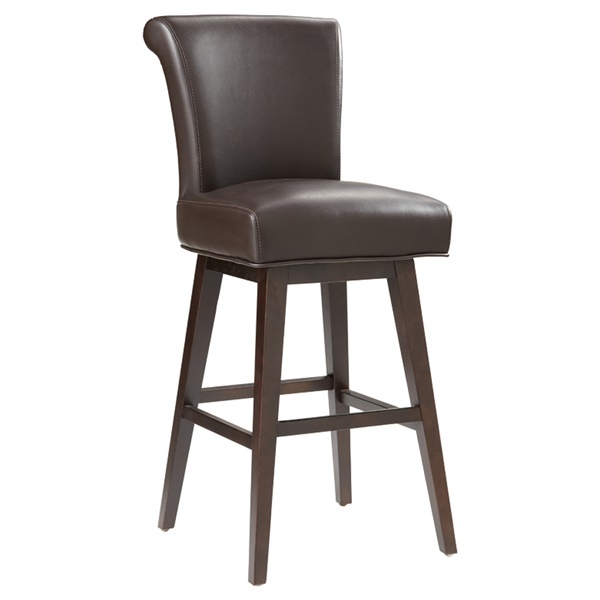 Simple, clean lines make the Hamlet Swivel Bar Stool ideal for a contemporary bar or pub table, while a plush look and feel and classic sensibilities make it warm and inviting. The Hamlet is as at home in a contemporary space as it is in a transitional one, and its understated and simple styling make it a good fit for any number of different decors. It�s ideal for use in a home, but it also provides perfect seating for restaurant guests. This stool features a sturdy and durable frame that�s crafted from solid wood, with built-in stretchers for added support and stability, and a swiveling feature for optimum positioning. Thick back and seat padding make the Hamlet exceptionally comfy, while supple bonded leather upholstery provides a sophisticated and luxurious feel.